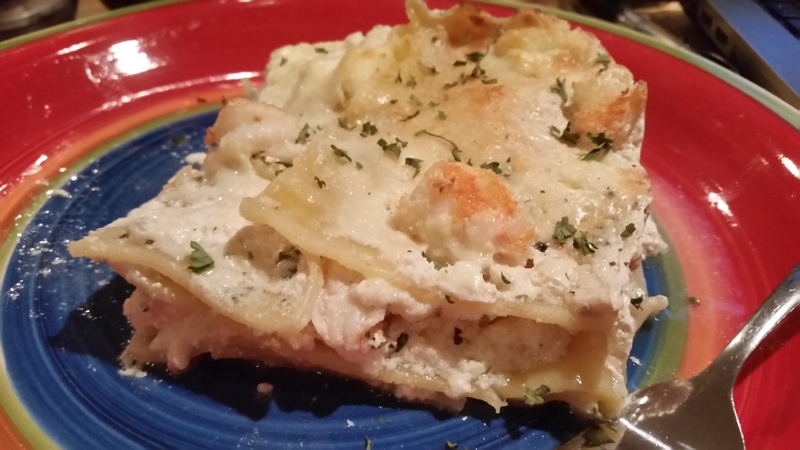 Shrimp Scampi Lasagna – What's for Dinner Moms? Can you believe Christmas is just a week away? Where did all the time go? Even my daughter said that this Christmas season flew by. We had plans for so many wonderful things that we just haven’t gotten to. But, we did get to do lots of great things like see one of my daughter’s friends in “Miracle on 34th Street” at a little local theater, we saw the lights downtown, drank hot cocoa, and ate Christmas cookies. I have to remember to think of all the great things we did do and not to worry about all the things we did not get to do. So, hard when you want to do it all! We have lots of parties and dinners during December and I am always looking for something a bit “different” to serve or take to a pot luck. 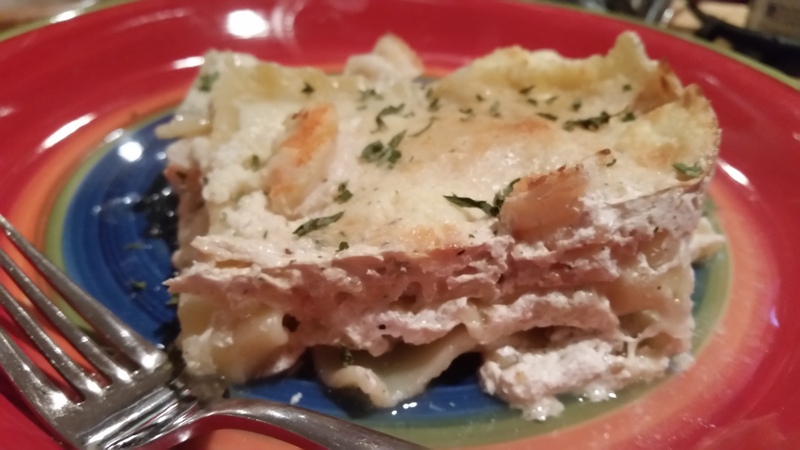 This is a great twist on traditional lasagna. It really does have the garlic, butter taste of Shrimp Scampi! Note: The only reason I made this a moderate recipe not an easy recipe is because the number of pans and dishes used in making the dish. The hardest part is making the sauce which is a variation on a traditional bechamel sauce – butter, flour, and milk. My family loved this lasagna. Even my ricotta hating boy had two servings. I think because it had so much flavor and the layers of ricotta were not overly thick but rather spread between each layer he really loved it. We all loved that it tasted like Shrimp Scampi but seemed a bit more “elegant.” This serves beautifully for a dinner or pot luck. We served this dish with a side of broccoli and a green salad to complete the meal. Preheat oven to 350 degrees. Spray a 9″ x 13″ casserole pan with non-stick spray. Set aside. Boil noodles according to package directions. Separate noodles and coat with a bit of butter to avoid sticking together. Mix ricotta cheese, egg, and Parmesan cheese in a bowl until well blended. Melt butter in a medium sauce pan over medium heat. Add onion to pan. Cook until onions are turning translucent. Add garlic to pan and saute for 1-2 minutes until garlic is fragrant. Sprinkle with flour and stir to make a paste. Allow to heat for 1-2 minutes while whisking, it may start to turn light brown and this is okay as long as it does not burn. Remove pan from direct heat and stir in milk and chicken stock. Return to heat and allow to come to a low simmer while whisking. Simmer for 10-15 minutes until it thickens. Stir in shrimp and basil. Allow to cook for about 3-4 minutes until shrimp just starts to turn pink. If using fully cooked frozen shrimp – stir thawed and dried shrimp into sauce and immediately remove from heat. Begin lasagna layers with 1/2 cup of sauce spread in the bottom of the pan. Top with 1/3 of ricotta mixture, followed by 1/3 of sauce mixture ending with 1 cup mozzarella cheese sprinkled over layer. Repeat layers so that you have 3 layers ending with mozzarella on top. Sprinkle Parmesan cheese over top of final layer and bake for 40-45 minutes. Remove pan from oven and allow to rest at least 5 minutes before cutting. Time has flown by Marci! A great recipe and very different. Happy holidays! So true! My youngest son too said how fast time went by!